I love this movie so much. I know that’s a weird thing to say about a film revolving around children forced to fight to the death, but this is a great adaptation of the book, which I also love. A lot of the credit for this film’s success goes to the wonderful cast of young actors, lead by current it girl Jennifer Lawrence, but it also helps that the book’s author helped adapt the screenplay. The Hunger Games is not the type of movie that you’d expect to resonate with teenagers. The story contains political criticism, social commentary, and dire environmental warnings. Personally, I think teens are smarter than a lot of people give them credit for. While many will chalk this film’s popularity up to graphic violence and attractive leads, I think much of the younger audience identified some of the heavier themes. It may not all sink in during the first viewing (or reading), but the story definitely sparks questions and conversations about issues that some adults would rather not think about. I also feel Games struck a chord with young women particularly thanks to Jennifer Lawrence’s portrayal of Katniss Everdeen. Katniss is a revelation on her own, a fully realized female lead who actively drives the story and saves her male counterpart. However, this character would have fallen flat if the wrong actress had been cast in the role. Lawrence is perfect, she embodies Katniss’ often contradictory personality so well. She displays masculinity and femininity, self-sacrifice and selfishness, confidence and doubt. This is Katniss taken directly from the page and transported to the screen. In fact, nearly everything about this movie is incredibly close to how I pictured it while reading the novel. Most of the characters are dead on, and those actors who differed from my expectations won me over by delivering excellent performances. Woody Harrelson in particularly did not strike me as Haymitch at first (he’s too old), but the actor does such a great job portraying the troubled alcoholic that I now can’t imagine anyone else in the role. The Hunger Games is one of the best film adaptations made in the past decade. An excellent cast adds to this great script, and the visuals are amazing. Like Harry Potter, this is a movie that always makes me want to watch the next in the series right away. The Hunger Games is an important story to me. It was a book I read when Sally and I first met. She had recommended it, and even though it had no pictures, I decided to give it a shot. When it was announced a movie of the book would be made, I was hesitant. How do you make this book into a film, and make it sanitised enough to get a PG-13 rating? I was worried that important elements would be cut in order to achieve this. Now I’m not one of those moron fanboys that think you can’t be true to the source material without an R rating, but I was curious how you could adapt a book about a group of kids locked in an arena murdering each other and have it be anything other than an R rating. 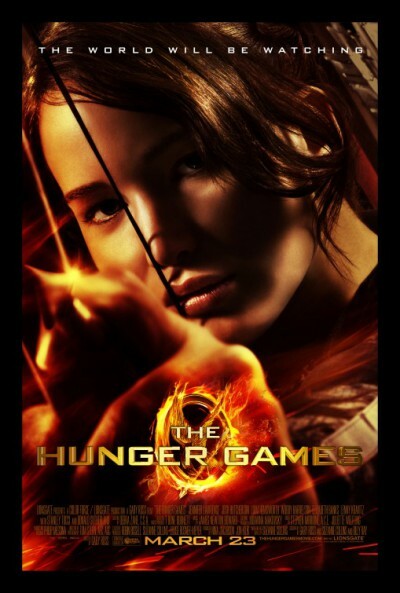 The story follows Katniss Everdeen (Jennifer Lawrence). She lives in a dystopian future version of the United States where the country has been carved into 12 districts, surrounding a large capital city called Panem. Each year a boy and a girl are chosen from each district to compete in the Hunger Games, which is basically putting these 24 kids into a stadium and watch them kill each other until there is only one left. It is basically the sickest version of reality tv ever made, and also a complete rip off of the Running Man. Anyway, Katniss’s sister Prim is drawn to compete and rather than let this happen, Katniss volunteers and she is sent to Panem to prepare for what will be her likely death with the male tribute Peeta (Josh Hutcherson). They are coached about what happens during the games and how they can possibly win by previous District 12 winner Haymitch Abernathy (Woody Harrelson) and Effie Trinkett (Elizabeth Banks). Katniss is an angry young girl, but does have some life saving skills, she is good with a bow, and has been caring for her family for years since her father died in a mining accident, so she is capable. Peeta has also cooked up a story that he is in love with her, so the audience might have some sympathy for these star crossed lovers that may have to kill one another if they are the last two left standing. This is a great adaptation. The story does a good job of showing how dangerous these games are, and while the deaths aren’t necessarily gory, the movie does not shy away from the fact that these kids are out there killing each other. The first half of the movie is good, but things get really great once the games actually begin. It is similar to a killer episode of Survivor where alliances are formed and broken, until there is one (or maybe more!!) left standing. Jennifer Lawrence is terrific as Katniss. It is such an important role, but Lawrence is able to believably portray Katniss as a warrior, but also a scared teenager. She does an amazing job in what would have been a tough role to do with a lot of pressure attached to it, given how popular the books were. The adult cast is fun too. I liked Harrelson as Haymitch, he is great as the former winner/drunk who is clearly suffering from post-traumatic stress disorder. I can’t end this review without mentioning my favourite part of the movie, Stanley Tucci as the host of the games, Ceaser Flickerman. He is the film’s highlight for me. Watching him in this role makes me wish he was really a host of a late night show, although perhaps one with a little tamer subject matter than the Hunger Games. The Hunger Games is an exciting ride with terrific performances from everyone involved. Given the difficulty there must have been when adapting this book, the film achieves everything it sets out to do, and more.